It’s difficult to out-grim a Grimm’s fairytale, in which stepparents are likely to exile stepchildren, plot their deaths, and possibly order up dishes that feature them served with a succulent sauce. It’s no wonder youngsters of yore behaved themselves. Wisely, Gaiman does not attempt this in The Sleeper and the Spindle: an inventive imagining of a sequel to Snow White and Sleeping Beauty. 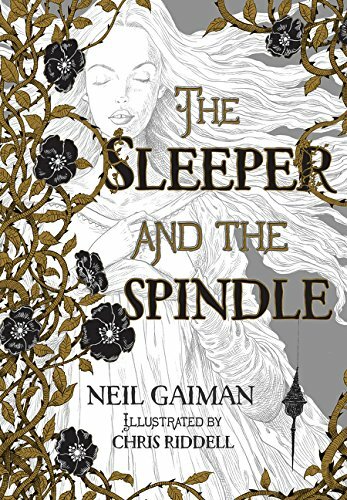 Richly illustrated by Chris Riddell, The Sleeper and the Spindle takes readers on a quest that is part adventure, part feminist treatise. There is a princess asleep in a castle in a distant kingdom. Sleep is slowly overtaking the land. If the princess is not awakened, all are doomed. In an unexpected and delightful twist, the hero who sets off to wake the sleeping princess is not a handsome prince but a lovely queen: The raven-haired Snow White, in fact, who, on the eve of her wedding, learns from seven dwarfs of the approaching sleep-plague. Or is it a curse? Or a spell? No one in the neighboring town can quite agree. They are also divided on the history of the sleeping princess. Was it a spell cast by a witch, a bad fairy, or an enchantress? This is likely Gaiman giving a wink and a nod to the many, differing versions of the familiar fairytales that have circulated through the centuries. The queen, whom Gaiman does not refer to as Snow White¾names, he tells us, are in short supply in his telling¾is happy to risk another lengthy sleep in order to avoid marriage, which she views as a fate far more dire and permanent. “It would be the end of her life, she decided . . . she would have no choices . . . the path to her death, heartbeat by heartbeat, would be inevitable.” This quest to save the kingdom has come just in time. The plucky lass throws off her wedding gown, dons her mail shirt, and heads off, accompanied by her seven short friends (also unnamed, as they were in the original tale) to rescue the sleeping princess and stem the advancing plague. Young women, and possibly Hollywood, will embrace her heartily. The familiar icons from Snow White and Sleeping Beauty are all here: the mirror, the apple, the roses, the spindle, but Gaiman has burnished them with irony, as though the characters are slightly embarrassed to find themselves trapped in such an improbable and timeworn tale. As when the queen asks one of her dwarf companions whether she will be sent to sleep if she ventures into the plague-ridden area. “He scratched his arse, unselfconsciously. ‘You slept for a year,’ he said. ‘And then you woke again, none the worse for it. If any of you big people can stay awake there, it’s you.’” When speculating on how the queen is supposed to wake the sleeping princess, one dwarf posits, “bowl of water poured on the face and a cry of ‘Wakey! Wakey!’?” Good stuff. It is the function of fairy tales to invite readers to search for metaphor and meaning, and Gaiman provides plenty of material. As the queen and her consorts sally forth, she is visited by memories of her difficult childhood (evil stepmother, etc.) and stalked by fears and losses. Mysterious crones, wolves, spiders, sleepwalkers provide rich fodder from fairytales most will have read as children. The provocative prose and the luscious illustrations invite close scrutiny. After waking the princess and discovering all is not as it had seemed, the queen calls her out: “It’s always the same with your kind. You need youth and you need beauty. You used your own up so long ago, and now you find ever more complex ways of obtaining them. And you always want power.” Worth pondering whom Gaiman is really addressing here. Not to mention the sleepiness that’s overtaking the land. Could it be present-day apathy and indolence? Would that it would take merely a kiss from a restless young queen to wake us. The Sleeper and the Spindle is a provocative sequel to two familiar fairytales, infused with Gaiman’s emblematic humor and nuance.